The minister of culture Monika Grütters awarded the projects, in which refugees participated with a special price of appreciation in Berlin. 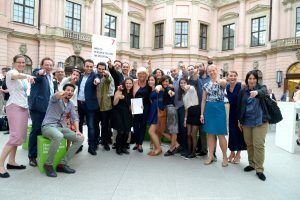 The awarding of this special price “Award for cultural Projects with participation of refugees” was the highlight of the Kick-off event, in the German History Museum in berlin on the 21st of Mai 2016. Multaka project was also rewarded the status of “Outstanding” by the initiative “Germany, the land of ideas” and the Deutsche Bank . Under the motto “NachbarschafftInnovation – community as a model of success”, Multaka project delivers a convincing answer to the question of how Community action can offer innovative solutions for tomorrow’s challenges. The national winner of the competition “Outstanding Landmarks in the land of ideas” was announced in 2016 and honored together with the audience-winner in a festive reception in the towers of the Deutsche Bank in Frankfurt am Main, on the 10th of November 2016. Jürgen Fitschen, Member of the Presidium of Germany – Land of Ideas and former Co-Chairman of Deutsche Bank, and Ulrich Grillo, President of the Federation of German Industries e. V. (BDI) and President of Germany – Land of Ideas e. V., led the awarding of the prize. 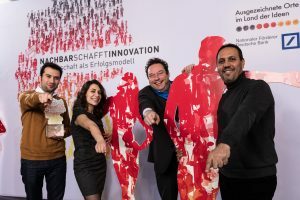 “Our National winners are role models for an open, innovative and strong community in Germany. They show that the secret of success lies within the community, partnership and cooperation. and are therefore a proof of a lively community in all its facets” commented Jürgen Fitschen. Ulrich Grillo added: “”The challenges of our time cannot be overcome by themselves. To remain a land of ideas in the future, we must concentrate our expertise and benefit from synergy effects. This is exactly what the award winners are doing excellently”. “Multaka: Museum as a meeting point” is the National winner of the cultural category “. Multaka was also nominated for the German Engagement price in 2016. In October 2017 Multaka won the Popular Choice Prize of the zenith Photo Award among 53 projects. We would like to take this opportunity to thank you very much on behalf of the Multaka Team for your votes and the great support. This will be a tremendous motivation for the 24 guides to continue and search for new ways to negotiate issues of our history, identity and origin together. Under the title ‘Syria Initiative – Museum as a Mediator of Shared Heritage’ – a project initiative of the Museum of Islamic Art to document and impart Syrian cultural heritage – has been awarded a ‘special regognition’ in the category ‘International Award’. The jury judged “Impressive and timely, it does not protect the heritage and history of Syria but reminds us of our global responsibility”. “The Syria Initiative – Museum as a Mediator of Shared Heritage” comprises 4 projects of the Museum of Islamic Art: the multi-award winning Multaka: Meeting Point Museum, in cooperation with three other museums and sponsored by the Alwaleed Philanthropies; the Syrian Heritage Archive Project, with the DAI and since 2013 funded by the Federal Foreign Office; the Aleppo Initiative, funded by the Gerda Henkel Foundation; and the Interactive Heritage Map, sponsored by the Andrew Mellon Foundation. “Our vision is to create a collective awareness of cultural heritage – a heritage that connects us through history. With the museum, we want to involve a new audience in the ongoing discussions about cultural heritage in conflict and social responsibility. The participants themselves name what their heritage is and are actively involved at all levels. 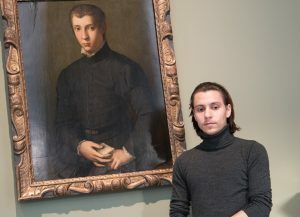 The projects have a strong participatory character, “emphasizes Stefan Weber, director of the Museum of Islamic Art.